I wasn’t really too sure what I was getting into when I requested this book, but having been in a band (albeit briefly)while in high school, I thought it would be fun to read a new graphic novel that follows along with some modern high schoolers also looking to play in a band. While the story is a little didactic, it is very appropriate for the target audience, which I take to be the middle school or junior high reader. Yes, it is about high school students, but most books for the younger readers feature stories of students just slightly older … characters that they can look up to and emulate, rather than those in the same situations as the young reader. The story primarily follows two young men in high school. They are nerds, geeks who do not quite fit in. One is totally smitten with a beautiful girl in his class but he’s too shy to do much more than stammer when he’s around her, though in his mind, she’s his girlfriend (boy, do I remember those painful days). The other is an over-weight young man with a chip on his shoulder and sees the negative side of everything. They may be the only friend the other has, and the only thing that seems to get them through the day (other than the pining for a girl) is their music. The school will be having a battle of the bands, and though it is some agonizing whether to sign up or not, the pair do get on the list, but they aren’t quite a band. They still need a drummer and a lead guitar. Part of the story features the pair finding the two additions for their band. The rest of the story deals with the relationships of the four, each one of them ‘stereotypical’ in some way. But one of them has a deep secret, and when it is revealed, will make the others face some cruel realities. I was quite impressed with the ease of the story-telling and how it caught me up in the story. The characters were indeed stereotypes, but at the same time, they were characters that all of us can identify with. There are people we know (if not ourselves) who embody the traits of these characters. The reality is that these four teens would probably not really hang out together and play in a band together, but being targeted toward a younger readership, it offers up some optimism and hopefulness. The secret held by one of the young men is on the one hand a very real issue and on the other hand a bit over the top for sentimentality. Again, we have to look at who this was written for and adult readers will understand the desire to educate as well as entertain. The art is clear, simple, black and white art. The characters are consistently drawn and the angles chosen by the artist(s) (not credited in my digital edition) keep the over-all appearance interesting. My one ‘complaint’ (though that seems too strong a word) is that I had no idea that one of the characters was African-American until it was mentioned in the dialog. It didn’t matter in any way, but it took my out of the story for a moment when it was mentioned. I see on the cover that he is colored appropriately for this, but the interior art does not reflect this. Overall, I was caught up in the story, learned a lesson or two about friendship and life, and finished with a feel-good attitude. That’s a pretty good way to spend a little time, especially for the student readers who are struggling with some of these issues. A nice addition is suggested songs to play while reading the different chapters. It definitely helped that this was generally music of my era and tremendously enjoyable. I can’t help but wonder if the young readers will actually enjoy this classic rock or not. I’d also suggest, or recommend, someone make a Spotify playlist of the recommended songs. It would have been a heck of a lot easier to play one playlist than to search for each song individually. Looking for a good book? 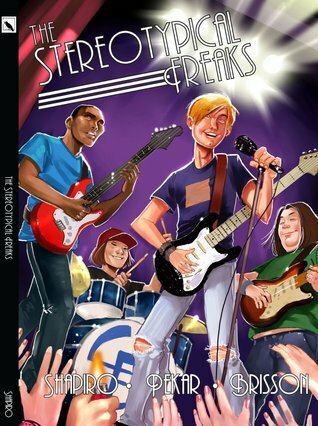 The Stereotypical Freaks is a graphic novel that speaks to kids and offers up hope even in the face of tremendous adversity and is well worth reading.